Saturday, January 26 from 1:00 p.m. until 3:00 p.m.
As Japan transitioned from the Edo Era to the Meiji Era, Japanese immigrants began settling in Hawaii and the U.S. mainland, including New York. Dr. Toyohiko Takami, the founder of the Japanese American Association of New York, came to the city in 1891, and Dr. Jokichi Takamine, founder of The Nippon Club, arrived here six years later. JAA, JACL (Japanese American Citizens League), and JAJA (Japanese Americans Japanese in America) are co-sponsors of this event, which features special guest speaker Dr. Daniel Inouye, a historian and attorney who specializes in analytical narrative history writing. Dr. Inouye has focused on the history of Asian/Pacific Americans as well as jazz, and he has taught courses at Columbia University, Queens College of the City University of New York, and NYU. He will discuss our predecessors in New York, the earliest Japanese communities that established roots here. 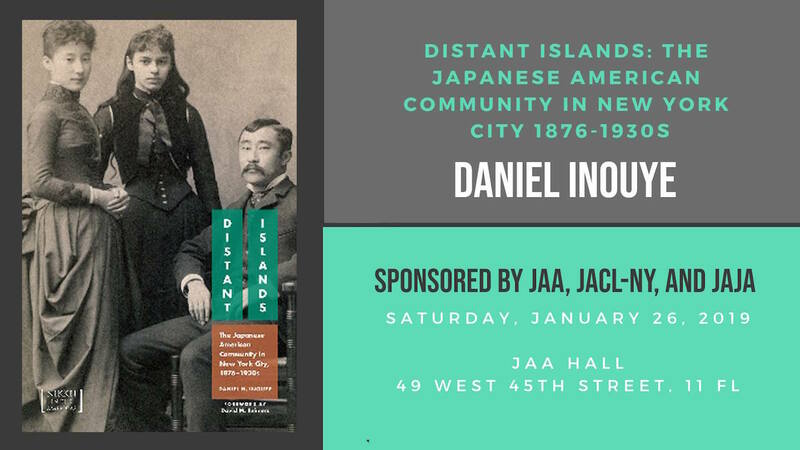 His new book, Distant Islands: The Japanese American Community in NY 1876-1930s, delves into this fascinating history that is often overshadowed in historical literature by the West Coast Japanese diaspora. To reserve your seat, please call JAA at 212-840-6942 or send an email to info@jaany.org. If you are unable to attend but are interested in purchasing Distant Islands, please visit the University Press of Colorado’s website.